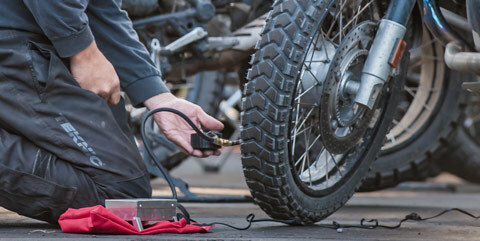 Whether on the street or exploring off-road terrain, you just never know when a repair will be required. 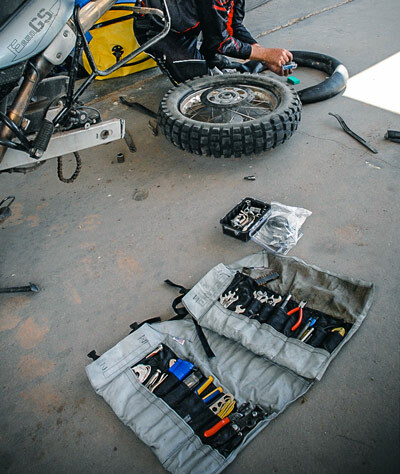 Since self-sufficiency is a must for any Adventure Rider, there is an inherent need to carry a compliment of tools and other emergency gear. A comprehensive tool kit streamlined for space-saving is perhaps your most important set of emergency equipment. Every hand tool you use to work on your bike should be in this kit and stored on the bike at all times. So this can take some time noodling around with your bike in the garage to identify what is an essential hand tool to store and what can be left behind without being hindered down the road. Alternatively, companies like Adventure Designs offer pre-assembled tool kits that are specific to the make and model of your motorcycle. Included in these bike-specific tool kits are everything you will need for most maintenance situations that may present themselves while on a ride. These sets have been meticulously assembled with reliability and and space-saving in mind. As a rule of thumb, if you purchase a pre-assembled bike specific tool kit; you should keep this set on your bike at all times and use only these tools even when performing maintenance in your own garage. This will better familiarize you with what you carry on the trail and maybe identify the need for extra tools beyond what is included in the kit. For example; a hammer can certainly help bang a bent side case back into shape, however, is too aggressive if you need to pop the front tire axle out during a tire change. A hard rubber mallet on the other hand, can perform both tasks and many more. Some other additions to consider are; an extra pair of pliers, a magnetic telescopic tool/screw retrieval tool, basic wiring strip and splice tools, shop rags, rubber gloves, etc. One of the many inevitabilities that can quickly spoil the enjoyment of the backcountry is a flat tire. The terrain is unpredictable and in most cases not maintained, and you will get a flat. But if you are prepared with the knowledge and proper repair tools, most flats can be fixed and have you back on the road in 15 - 20 minutes. A compact tire pump/compressor and tire irons or “spoons” like those provided by BestRest Products, in addition to plugs, patches and/or extra tubes (depending on your tire type) will have you back in right order in very little time. Online video tutorials or instructional Dvds (also provided by BestRest) can aid in training you to efficiently and speedily patch your tire. Editor’s note: Purchasing a used “sacrificial” tire and tube and then spending a day mounting, piercing, removing, patching, remounting, and repeat - is what taught this writer and gave him the confidence to do so on the trail. A useful addition to your tire changing equipment is a small bottle of 50/50 window cleaner and water. This can be used to lube the rim when prying the tire on and off as well as to identify small punctures invisible to the eye. 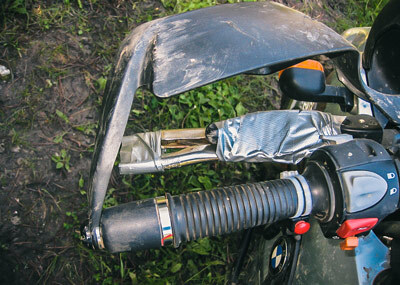 For self-reliance on a multi-day adventure ride. for any unpredicted weather change).